Welcome to Hair Transplant Los Angeles, a site for men and women suffering from hair loss. Dr. Sean Behnam and his staff are dedicated to helping patients regain their hair. Our goal is to provide patients with the information they need to choose a hair loss solution. To educate each patient on all possibilities so an informed decision can be made. Dr. Behnam is sensitive to the emotional impact hair loss can have, his practice is committed to treating hair loss with the respect it deserves. Often patients ask “Is it worth it to get a hair transplant?” That depends on how bothered the patient is by hair loss. Some men look great with a shaved head while others feel they look better with hair. For some men, hair loss can be devastating and cause them to lose confidence and lower their quality of life. Hair loss can symbolize the loss of youth and can often make men look and feel older than they are. Also, though female hair loss is tragic, men or more likely the be the object of jokes once hair loss becomes noticeable. Those who have never experienced hair loss usually have no clue as to how upsetting it can be which often results in more ridicule of those with hair loss. For those who are bothered by hair loss, now more than ever the process of hair restoration has become more user friendly and relatively inexpensive. Over the years, the technology has gotten better and down time has reduced significantly. Dr. Behnam understands that every man must decide for himself if hair restoration is right for them. In the free consultation he gives each patient clear specific information on all current remedies to help each patient understand what to expect from each remedy. Dr. Behnam will prescribe the best remedy for each patient. Often patients will benefit more from a remedy other than surgery. A team of quality trained and experienced hair replacement specialists. A full range of Financing available. So many patients have said that their peers who used to make fun of them now come to them for guidance about their own hair loss. It’s not just the respect that you get from others, there is a certain amount of self respect that is gained from having an issue and conquering it. 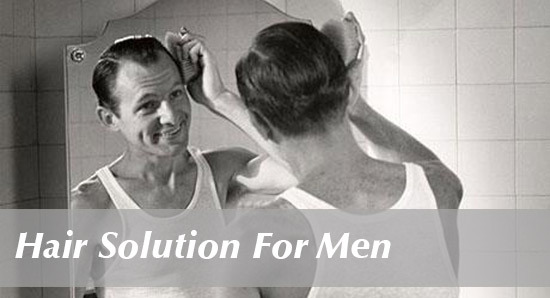 We urge all men and women who are suffering from hair loss to do as much research as possible. We have found that patients who are the most informed are the most happy. We recommend that you read all that you can and see other doctors. In your free hair loss exam we will show you as many pictures as you would like to see and answer all of your questions. We understand that this is your decision and we want you to have all the information that is needed to make you feel comfortable. As part of your research we urge you to read our reviews on Doctor Base, Insider Pages, Vitals, and yelp. We also have videos on youtube that can be helpful. We never charge for consultations even if you would like more than one. We hope you find our website informative and helpful. 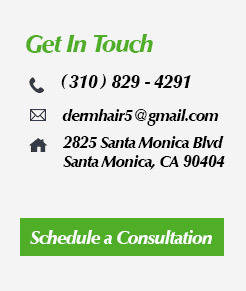 Please call 310-829-4291 when you are ready for your free hair loss exam.